Postgraduate students at Elam range from graduates looking to enhance their skills to creative practitioners keen to pursue research, advance their careers or explore new avenues of artistic endeavour. Here, a few current students share their experiences. “I decided to study fine arts at Elam because the School has the best reputation and was recommended by people I respected. Elam takes a strong academic attitude to art-making, which pushes your thought processes and understanding of art. You are around talented and creative people making good and interesting work. “It was really helpful to have access to professional equipment and computer programs, as well as the amazing range of specialty publications in the Elam and General libraries. Tim Wagg graduated in 2013 with a Bachelor of Fine Arts (Honours) (BFA(Hons). “The Master of Fine Arts (MFA) programme is largely self-directed. This was quite important for me because I have already sustained an art practice for some time. One of the main benefits of studying at Elam is the generosity of the staff and other students. You just don’t get people ready to dedicate so much time and thought to your work anywhere else. Roman Mitch recently graduated with a Master of Fine Arts (MFA). Having completed her BFA here nearly a decade ago, Jessica Pearless returned to Elam School of Fine Arts to study for a Master of Fine Arts, graduating in 2010. In between, she worked in the commercial world of fine art in New Zealand, auctioneering and fundraising for public art programmes affected by the Christchurch earthquakes. Currently she is focused on making and exhibiting her own art, and is also working as the inaugural artist in residence at Artists Alliance in Ponsonby, Auckland. Seung Yul is filmed with a pair of his Oddooki Children under the glass dome at Gus Fisher Gallery. Inspired by children's weighted toys that always right themselves, these bright ornithological pieces effortlessly straddle the commonly separated realms of enticing interactive toy and high art sculpture. After graduating from Elam School of Fine Arts in 2006, Seung Yul quickly gained a profile as a multi-disciplined artist with his painting, drawing, sculpture, sound and video. 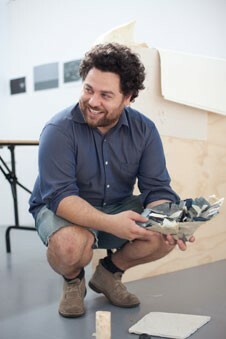 He has exhibited at Starkwhite Gallery, Auckland, the Auckland Art Gallery, the Govett-Brewster Art Gallery (New Plymouth), the Museum of New Zealand Te Papa Tongarewa and The NewDowse. "The most enjoyable part of studying at Elam has been the opportunity to be taught by, and develop relationships with, some of New Zealand's most respected artists...The knowledge I've gained keeps me excited about my work and unafraid to step outside my comfort zone." Toby Raine is currently studying for a Doctor of Fine Arts (DocFA).